Hey there! 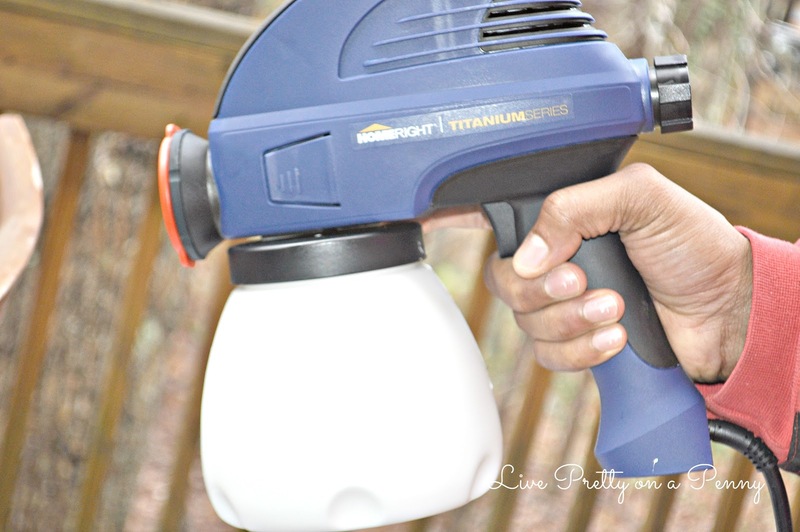 This post is long overdue, as this DIY was completed back in January. I know, just terrible! But here we go. So my kitchen is pretty small in my opinion and when we first moved it, to offer some type of seating in there, we opted for a small bistro table from Ikea. 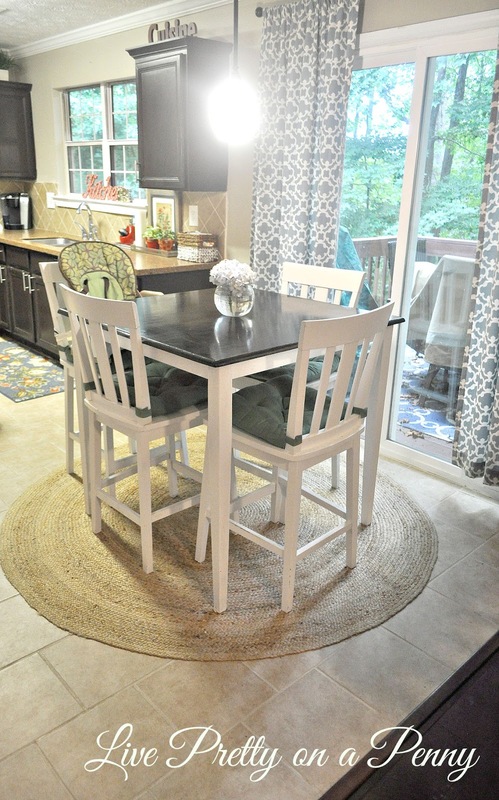 However, as we grew in our home, and my taste changed, the Ikea Bistro table just did not seem like a good fit anymore so I sold it. I then scoured Craigslist for a couple months until I found exactly what I was looking for. 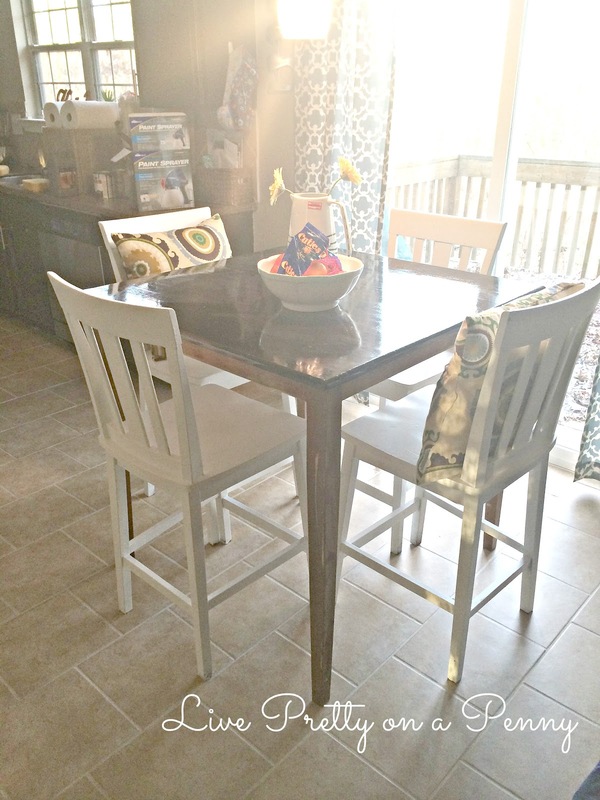 I wanted a bar height table, with four chairs, but the catch was that it had to be no bigger than 43 inches all the way around. Most bar height tables are more than that. So while I saw many I liked, they would have been too big for the space. This pic is straight from the Craigslist Ad. I knew that this table was for me. 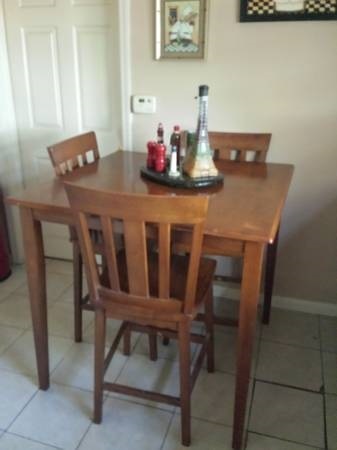 The dimensions were perfect, it was solid wood, had the four chairs, and the seller responded quickly. Oh and it was only $100. The next day, my husband and I headed out to get the table. It was just as I thought in person, and I knew it would look great made over. To get it home, we had to detach the legs from the top to fit it and the four chairs in the car. When I got home, I laid it out and got to work! 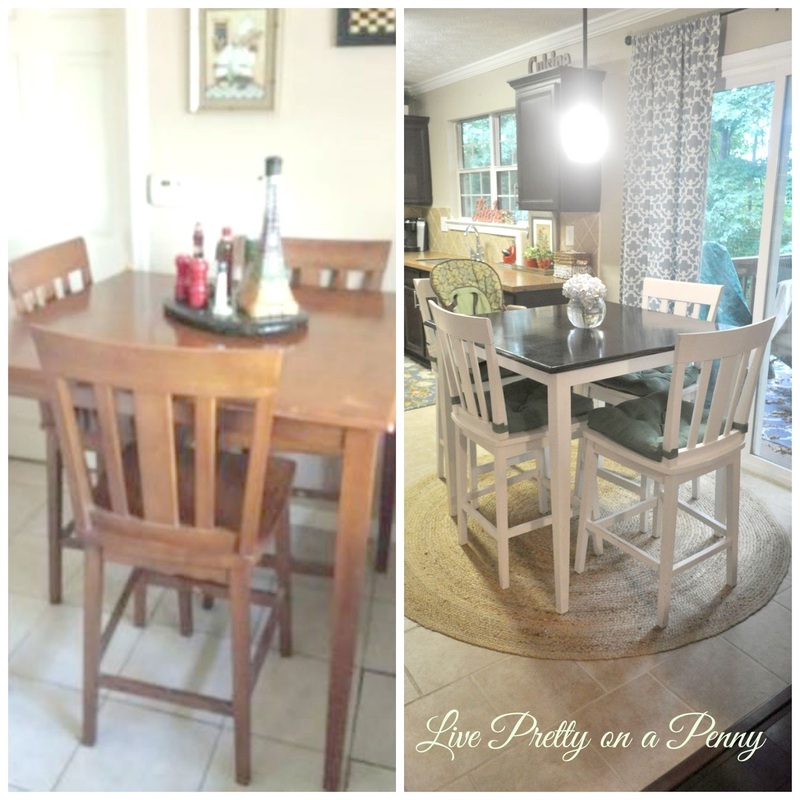 Using the exact same process from my oak dining room table makeover, I stained this table using the EXACT same process. So please refer to that tutorial for staining instructions and pictures of tools and items used. 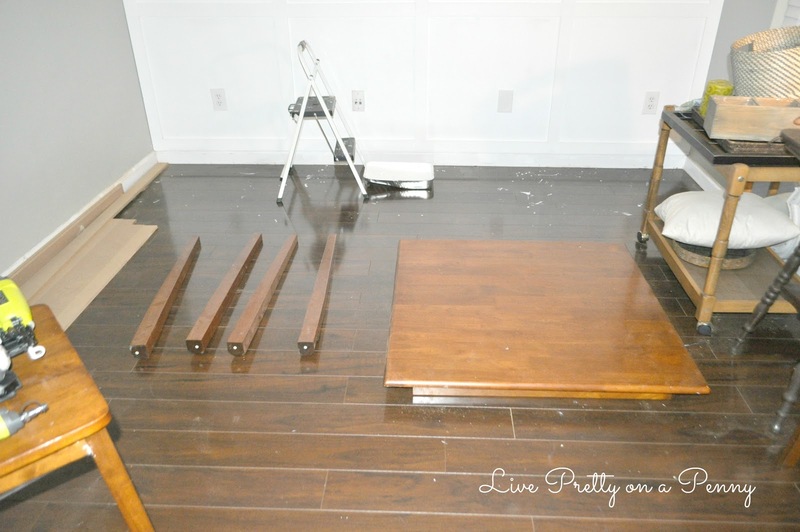 First,I removed the varnish (protectant) from the table top, legs, and chairs. That was a lot of work. I don’t think I really thought about how tedious that process would be, but I got it done.All of the tools that I used can be found in this past tutorial. 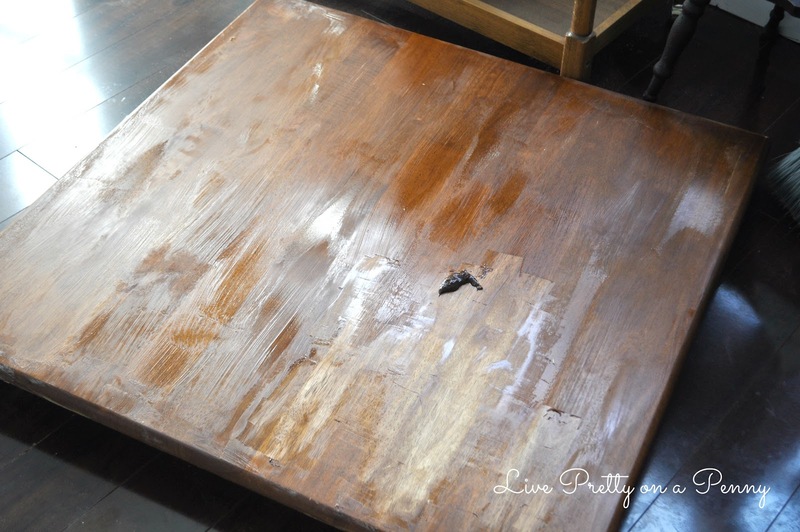 After removing the varnish and wiping the table down, I applied the stain. It was the same stain used in the past tutorial as well. After a couple coats of stain and Poly, the base was complete. I then had to figure out what I wanted to do with the legs and chairs. 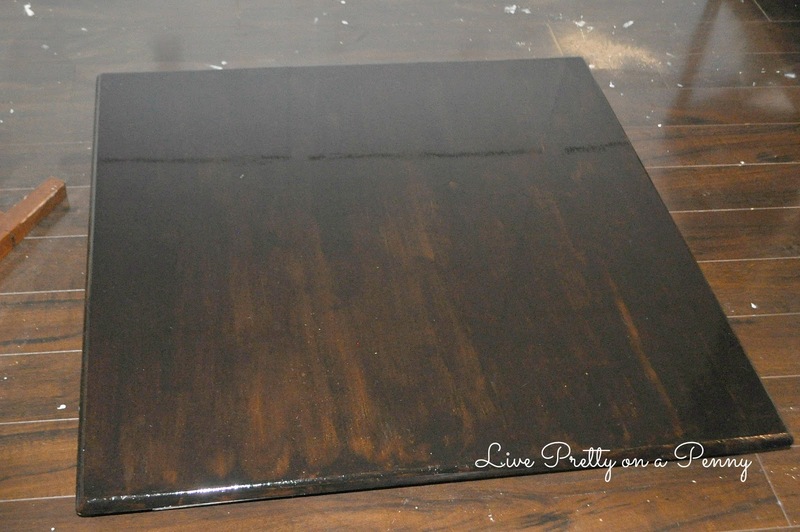 I knew that I did not want the entire table brown, as that would be waaay to dark of the kitchen since the cabinets are dark. 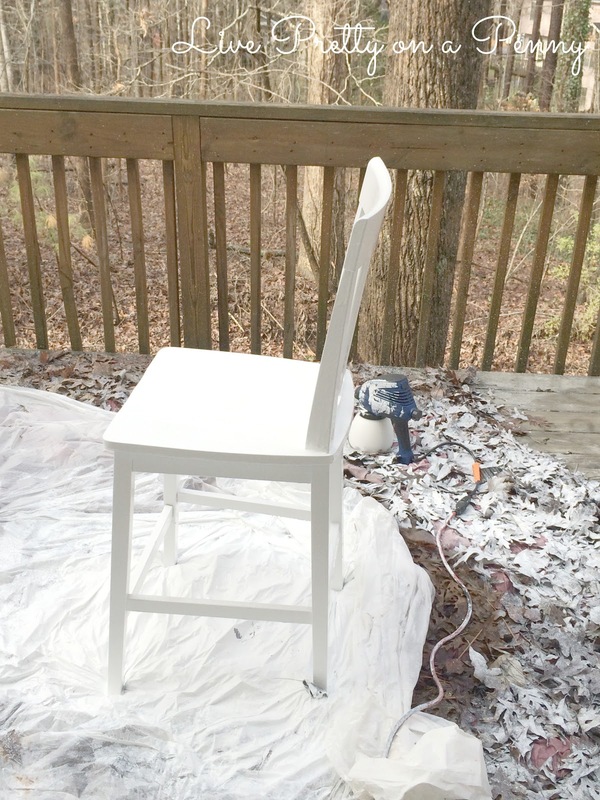 Using my HomeRite paint sprayer, I sprayed all four chairs white. 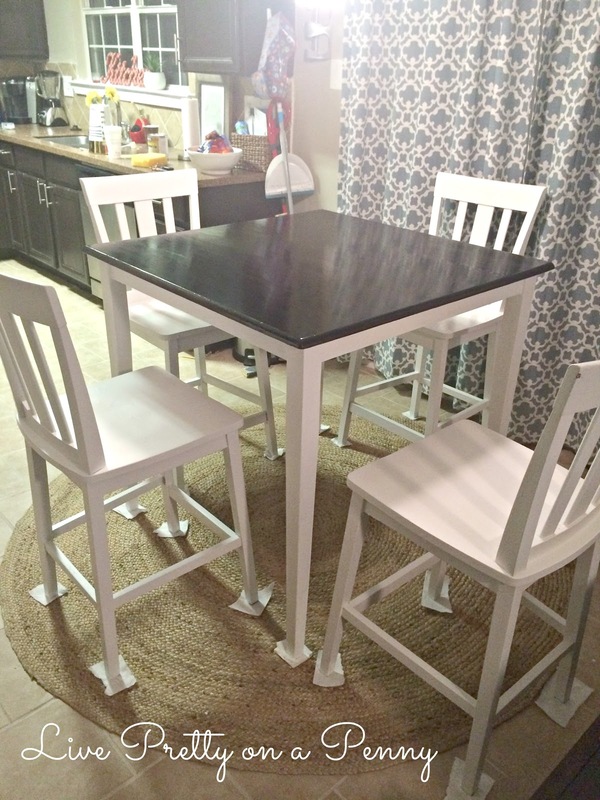 I used a simple sponge roller and painted the legs, and just under the base of the table white as well. I added the green seat covers so that the chairs are comfortable. They were purchased from Ikea for $4.99 each. 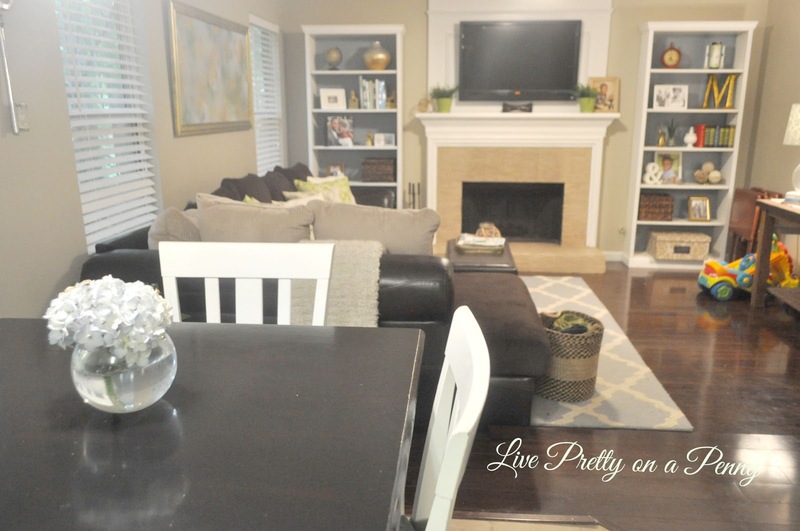 Here is a peek at the table, which looks into my family room. How about anothers side by side? 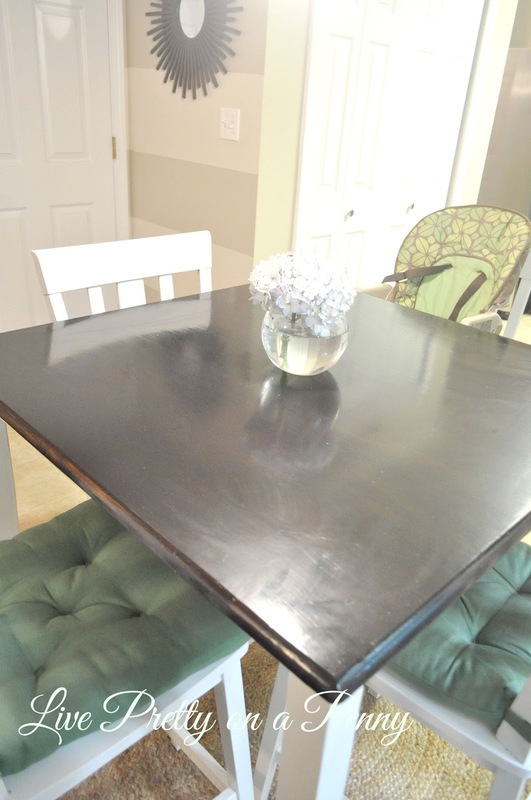 If you have a piece of wood furniture that you are considering staining, go for it! It’s really not as hard as you think, and has been very rewarding for me throughout my household. 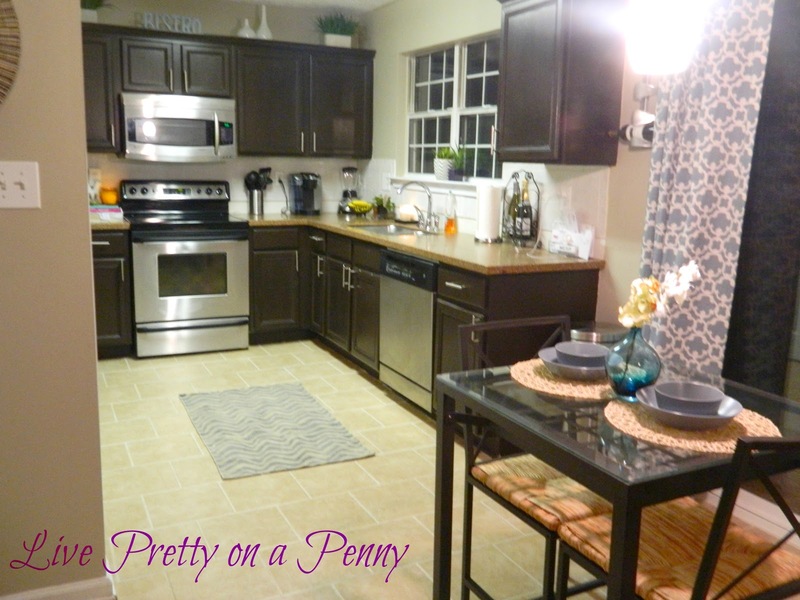 It looks great Erin, and perfect for the space. This looks fabulous. I love the contrast between the dark stain and the white.